Oct4 is highly expressed in undifferentiated embryonic stem cells and cancer stem cell-like cells (PMID: 26013162, 21826175). ab181557 can’t detect the target band in undifferentiated cancer cell lines with low expression level of Oct4, such as HeLa, HEK-293, MDA-MB-231, HepG2, Huh7, HCT-116 and PANC-1 (PMID: 21975933, 29789579, 25625591, 26059097, 23928699, 27344963, 25837691, 29254202, 28854261, 27996162), even at the dilution of 1:200. Synthetic peptide within Human Oct4 aa 1-100. The exact sequence is proprietary. WB: NCCIT, F9, and NTERA-2 cl.D1 whole cell lysates. IHC-P: Human seminoma and dysgerminoma of ovary tissues. ICC/IF: NCCIT cells. IP: NCCIT whole cell extract. ChIP: Chromatin prepared from F9 cells. Our Abpromise guarantee covers the use of ab181557 in the following tested applications. WB 1/1000. Detects a band of approximately 45 kDa (predicted molecular weight: 39 kDa). ChIP Use 5 µg for 25 µg of chromatin. IHC-P 1/1000. Perform heat mediated antigen retrieval with citrate buffer pH 6 before commencing with IHC staining protocol. Transcription factor that binds to the octamer motif (5'-ATTTGCAT-3'). Forms a trimeric complex with SOX2 on DNA and controls the expression of a number of genes involved in embryonic development such as YES1, FGF4, UTF1 and ZFP206. Critical for early embryogenesis and for embryonic stem cell pluripotency. Expressed in developing brain. Highest levels found in specific cell layers of the cortex, the olfactory bulb, the hippocampus and the cerebellum. Low levels of expression in adult tissues. Belongs to the POU transcription factor family. Class-5 subfamily. Highly expressed in undifferentiated embryonic stem cells and expression decreases gradually after embryoid body (EB) formation. The POU-specific domain mediates interaction with PKM2. Sumoylation enhances the protein stability, DNA binding and transactivation activity. Sumoylation is required for enhanced YES1 expression. Ubiquitinated; undergoes 'Lys-63'-linked polyubiquitination by WWP2 leading to proteasomal degradation. Nucleus. Expressed in a diffuse and slightly punctuate pattern. Immunofluorescent analysis of 4% paraformaldehyde-fixed, 0.1% Triton X-100 permeabilized NCCIT (Human pluripotent embryonic carcinoma) cells (positive cell line) or NIH/3T3 (Mouse embyro fibroblast) cells (negative cell line) labeling Oct4 with ab181557 at 1/250 dilution, followed by Goat anti-rabbit IgG (Alexa Fluor® 488) (ab150077) secondary antibody at 1/400 dilution (green). 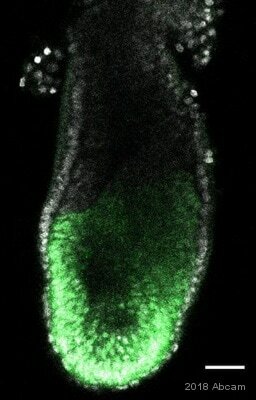 Confocal image showing nuclear and weakly cytoplasmic staining on NCCIT cell line. Negative expression in NIH/3T3 cell line. The nuclear counter stain is DAPI (blue). Tubulin is detected with ab7291 (anti-Tubulin mouse mAb) at 1/500 dilution and ab150120 (AlexaFluor®594 Goat anti-Mouse secondary) at 1/500 dilution (red). -ve control 1: ab181557 at 1/250 dilution followed by ab150120 (AlexaFluor®594 Goat anti-Mouse secondary) at 1/500 dilution. -ve control 2: ab7291 (anti-Tubulin mouse mAb) at 1/1000 dilution followed by ab150077 (Alexa Fluor®488 Goat Anti-Rabbit IgG H&L) at 1/400 dilution. Immunohistochemical analysis of paraffin-embedded Human seminoma tissue labeling Oct4 with ab181557 at 1/1000 dilution, followed by Goat Anti-Rabbit IgG H&L (HRP) (ab97051) secondary antibody at 1/500 dilution. Nuclear staining on cancer cells of Human seminoma is observed. Counter stained with Hematoxylin. Negative control: Used PBS instead of primary antibody, secondary antibody is Goat Anti-Rabbit IgG H&L (HRP) (ab97051) at 1/500 dilution. Immunocytochemistry/ Immunofluorescence - Anti-Oct4 antibody [EPR17929] - ChIP Grade (ab181557)This image is courtesy of an Abreview submitted by Joanne Lacey. 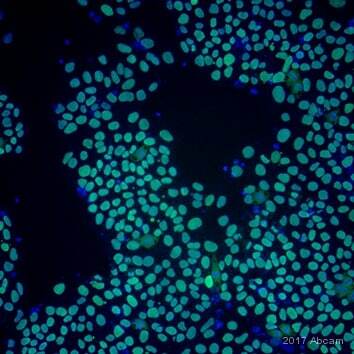 ab181557 staining Oct4 in Human embryonic stem cells by ICC/IF (Immunocytochemistry/Immunofluorescence). Cells were fixed with formaldehyde , permeabilized with 0.1% Triton in PBS for 1 hour and blocked with 10% Serum for 1 hour at 25°C. Samples were incubated with primary antibody (1/200 in PBS with 0.1% Tween20) for 16 hours at 4°C. 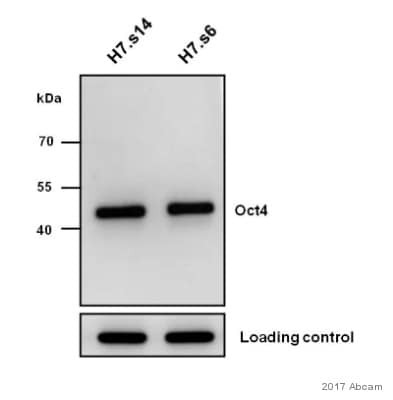 A monoclonal Goat Anti-rabbit Alexa Fluor® 594 was used as the secondary antibody at 1/200 dilution. Chromatin was prepared from F9 (Mouse embyro testicular cancer cell line) cells according to the Abcam X-ChIP protocol. Cells were fixed with formaldehyde for 10 minutes. The ChIP was performed with 25µg of chromatin, 5µg of ab181557 (blue), and 20µl of Anti rabbit IgG sepharose beads. 5μg of rabbit normal IgG was added to the beads control (yellow). The immunoprecipitated DNA was quantified by real time PCR (Sybr green approach). “pro” stands for promoter region, while “NC2” stands for negative control which is negative loci at the promoter region. Immunohistochemistry (Frozen sections) - Anti-Oct4 antibody [EPR17929] - ChIP Grade (ab181557)This image is courtesy of an Abreview by Bryan Niedenberger. ab181557 staining Oct4 in mouse testis (postnatal day 6) tissue sections by Immunohistochemistry (IHC-Fr - frozen sections). Tissue was fixed with paraformaldehyde, permeabilized with 0.1% Triton X-100 in PBS and blocked with 3% BSA for 30 minutes at 20°C. Samples were incubated with primary antibody (1/1000) for 1 hour at 20°C. Ab150081 (1/500) was used as the secondary antibody. Oct4 was immunoprecipitated from 1mg of NCCIT (Human pluripotent embryonic carcinoma) whole cell extract with ab181557 at 1/50 dilution. Western blot was performed from the immunoprecipitate using ab181557 at 1/10000 dilution. 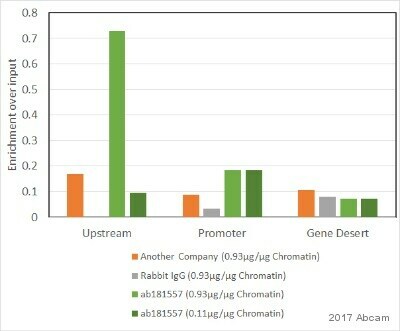 Anti-Rabbit IgG (HRP), specific to the non-reduced form of IgG, was used as secondary antibody at 1/1500 dilution. Lane 1: NCCIT whole cell extract 10 µg (Input). Lane 2: ab181557 IP in NCCIT whole cell extract. Lane 3: Rabbit monoclonal IgG (ab172730) instead of ab181557 in NCCIT whole cell extract. Observed band size: 45 kDa why is the actual band size different from the predicted? 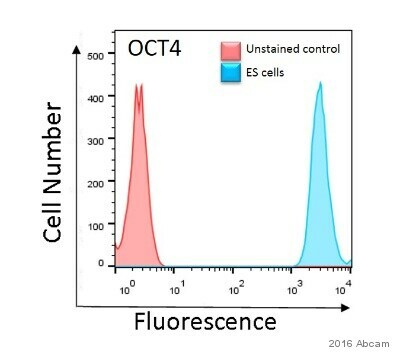 ab181557 staining OCT-4 in the human cell line NCCIT (human pluripotent embryonal carcinoma) by flow cytometry. Cells were fixed with 4% paraformaldehyde and the sample was incubated with the primary antibody at a dilution of 1/70. A goat anti rabbit IgG (Alexa Fluor® 488) at a dilution of 1/2000 was used as the secondary antibody (Red). Isotype control: Rabbit IgG monoclonal [EPR25A] ab172730 (Black). Unlabelled control: Cell without incubation with primary antibody and secondary antibody (Blue). Immunohistochemical analysis of paraffin-embedded Human dysgerminoma of ovary tissue labeling Oct4 with ab181557 at 1/1000 dilution, followed by Goat Anti-Rabbit IgG H&L (HRP) (ab97051) secondary antibody at 1/500 dilution. Nuclear and weak cytoplasmic staining on cancer cells of Human dysgerminoma of ovary is observed. Counter stained with Hematoxylin. Immunohistochemical analysis of paraffin-embedded Human breast cancer tissue labeling Oct4 with ab181557 at 1/1000 dilution, followed by Goat Anti-Rabbit IgG H&L (HRP) (ab97051) secondary antibody at 1/500 dilution. Negative staining on Human breast cancer. Counter stained with Hematoxylin. Immunohistochemical analysis of paraffin-embedded Human testis tissue labeling Oct4 with ab181557 at 1/1000 dilution, followed by Goat Anti-Rabbit IgG H&L (HRP) (ab97051) secondary antibody at 1/500 dilution. Negative staining on adult Human testis. Counter stained with Hematoxylin. 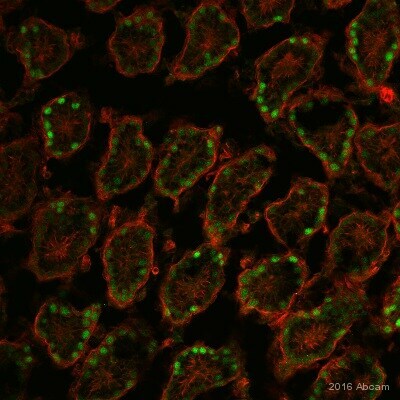 Immunohistochemical analysis of paraffin-embedded Mouse kidney tissue labeling Oct4 with ab181557 at 1/1000 dilution, followed by Goat Anti-Rabbit IgG H&L (HRP) (ab97051) secondary antibody at 1/500 dilution. Negative staining on adult mouse kidney. Counter stained with Hematoxylin. Immunohistochemical analysis of paraffin-embedded Rat testis tissue labeling Oct4 with ab181557 at 1/1000 dilution, followed by Goat Anti-Rabbit IgG H&L (HRP) (ab97051) secondary antibody at 1/500 dilution. Negative staining on adult rat testis. Counter stained with Hematoxylin. Publishing research using ab181557? Please let us know so that we can cite the reference in this datasheet.